Franchise India Ventures is an integral part of Franchise India which is Asia's largest integrated Franchise and Retail solution company since 1999, with an absolute authority on Franchising, Retailing & Licensing. In business, just as in life, one seeks the advice and guidance of a specialist when one is in the crucial crossroads. A specialist who is not just an authority in a particular subject matter, but also a master in analyzing the options available, discern the minutest detail, and suggest the most appropriate one that would best suit the situation. A specialist one can trust to make the most important decision in one's life, or business. We at Franchise India Ventures are such specialists. With years of deep understanding of the Mid Market segment, and a great expertise in offering Capital Advisory Services to a wide range of organizations from divergent industries, we have been playing our role to perfection. Being a part of Asia's largest business brokerage group - Franchise India, which sells more business than anyone else in this part of the world � we thoroughly understand the structure, working and the needs of the mid marker organizations. And offer our advisory services to this dynamic segment that has the potential to outgrow. As specialists who help privately held companies capitalize, acquire and divest assets, with deep domain experience in Mid Market space, we at Franchise India Ventures (FIVPL) offer comprehensive capital advisory services. These include Strategy Consultancy, Growth Planning, Corporate Restructuring, Debt Financing, Private Equity and Mergers & Acquisitions. Solutions that will not only help your organization in lowering capital acquisition costs or in getting better valuation, but also sustain the high level of growth. On board Franchise India Ventures are experts who are authorities in their respective field. The diverse talent pool comes from Franchising Business, Capital Services and Mid Market Management. The top team members at Franchise India Ventures bring a wide range of experience that spans many domains, from MNCs and FFIs to many corporate giants. Here�s a glimpse of their expertise across different aspects of Capital Services: Financial Modeling, Valuations, Corporate Strategy, Business Development, Deal & Investment Analysis, Financial Planning & Analysis, Company and Industry Overviews, Strategy Formulation and Execution, Mergers & Acquisition, Divestment Targets, Competitive Intelligence, Comparable Financial Analysis, Industry Research & Operations, Investment Banking and so on. Chairman, Franchise India Holdings Ltd.
A born entrepreneur, Gaurav started his first business at the age of 16, and over the years has started and sold some 15 other businesses ranging from mobile phones, career advisory, restaurants to entertainment business, and others. 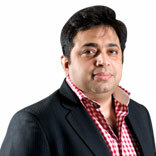 Widely known for initiating the Franchise revolution in India, Gaurav is the visionary force behind Franchise India. Under his leadership, Franchise India has moved from strength to strength, and is well acknowledged for changing the way companies plan the course of action for their business development.